Back in August 2008 I had a rare opportunity to go to China for the World Urban Youth Forum. Now that was an experience I will cherish because of the different experiences I had in a span of a week. First of all, I was afraid of touching anything with milk because just around that time, babies had died from milk poisoning. I ate clearly labelled foods just to be sure. As for milk, I played safe by taking something that looked like lemonade for breakfast every day. The Chinese are very friendly people. The problem is the language barrier. During our shopping spree, we would meet several business men and women who did not have a clue what we were talking of. A young man who was selling bags, just knew three English words, “You are beautiful”. He even took a selfie with me. Maybe I was too slow to notice that someone had a crush on me. What were we talking about again? Oh, the language barrier was such that we used calculators to communicate. Thanks to numbers, a universal language. Before my short Chinese trip was over, I had made friends with several locals who could speak English, so the shopping trips were a lot easier. I remember Yan Erhaoa, one friend who was very helpful in the translation. I still can’t believe I was the only one in the group who came back without a ‘Chinko’ phone or other powerful gadget. I was afraid of ending up with a fake something. Wait! That’s what broke people say, right? Maybe that too. Yours truly enjoying a delicacy of pork dumplings. Now, today in my social media foraging, I came across a story about fake Chinese plastic rice. Now that’s interesting. Plastic what? So I googled about it and apparently, it is the latest of scandals bedeviling the Chinese food industry. Apparently, some great business minds have discovered the huge profits that they can get from Wuchang rice. They therefore mix industrial plastic resin with potatoes and make plastic rice. They mix the plastic rice with original Wuchang rice then spray it with artificial fragrance. Smart ha? Health experts warn that this is a special type of digestible plastic which melts inside human stomach. Eating just three bowls would equal eating a plastic bag. 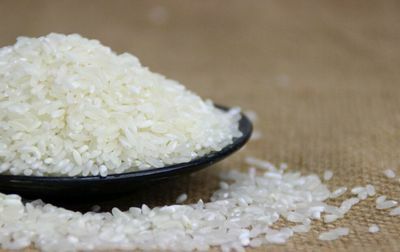 This rice can cause ulcers and cancers after prolonged consumption. China has everything from fake eggs, watermelons, meat, and maybe more. Who knows, I may have ingested some of that. God forbid! Now, rice is the Chinese staple food. We even ate rice for breakfast while in China. They even made porridge out of rice. We were really careful when eating, we picked the halal food tent and KFC meals just to be sure we were not eating anything strange. All the same, I enjoyed my stay in China. Well, this made me think of the local pishori rice that is usually mixed with other cheap quality rice and sold at the exorbitant price of pishori rice. Now that is nothing compared to the Chinese revelation. Still, we should be on the lookout for the fake rice because with the free market, you never know the imports that may end up in the country. You can watch a video on the latest revelation. Separator image Posted in Dada Afya and tagged with China, Fake food scandals, Plastic rice.